We moved and tried to park in the gravel lot near the street on the right side as you turn into the casino as a semi was in there and another one pulled in right before us. 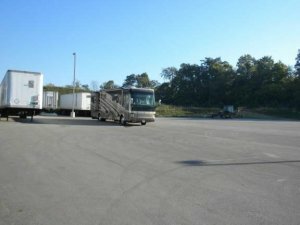 I asked the semi driver if it was ok to park overnight or even at all and he said that he had never had any problems. Unhooked the toad to go up to the casino and security pulled in and ordered us to leave. I pointed out that the sign only said "No truck parking" and nothing about RVs. He was very rude and stated again, "We don't want your kind here." I called the management at Cannery Corporate in Las Vegas as I couldn't get any answer from management here. They were able to link me with the manager on duty who said that the security officer should not have said that about "our kind" (duh!) and that they would probably be allowing RV parking somewhere on the grounds in the future. We came down to the Walmart and there are about 6 rigs here that are either dropped or have toads missing so I imagine they are staying here and driving down there to gamble. I will NOT be patronizing them personally after this though.